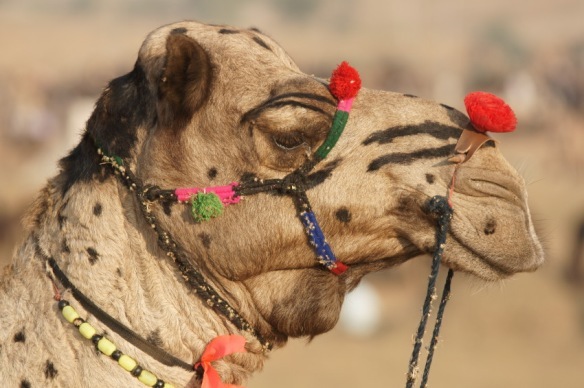 The first thing that comes to mind when you enter the Pushkar Camel Fair is the scale and riot of colours around. You get overwhelmed and greedy at the same time. You want to capture every shot, every colour and every mood from all angles possible. But that is not the best strategy. Here are top 10 tips to help you shoot Pushkar Fair for posterity. 1. Reach at least two days before the Pushkar Camel Fair officially begins. Familiarise yourself with the topography and the way light (read sun) behaves at different times of the day. 2. During the first two days the action won’t be at the fairgrounds but on roads and pathways leading to the venue. It is where you get the shot of camel trails with owners making a beeline to fairgrounds. Your chances of making best photos are at dawn and dusk. 3. Don’t start firing all cylinders the moment you see a photo taking opportunity. Compose your shot and then shoot. 4. Smile and humility make a difference between a good and great shot. Your subjects (local people in the fair), though easygoing and friendly need to be taken into confidence before you click them. 5. Identify the areas where you’ll get the shot of your life. Some of the areas to explore include tea shops; place where camels and horses are tended; and locals retreating for the day to their makeshift shelters. 6. If you are a novice but a passionate photography enthusiast, enroll in a photography tour especially conducted during Pushkar Fair by various organisations. 7. Be careful when shooting animals especially camels, which are notorious for biting, kicking and spitting. 8. During the 2nd half of the Pushkar Camel Fair, the action shifts from fairgrounds to the Pushkar Lake. Head there before others do and find a vantage point. 9. Photo Ideas: Long shadows, low sun, subjects with turban & moustache, silhouettes, smoke rising from campfires, women shopping in colourful traditional clothes. 10. Dust is the biggest enemy of a camera. Protect your gear from dust. Carry and use cleaning material for your lenses.